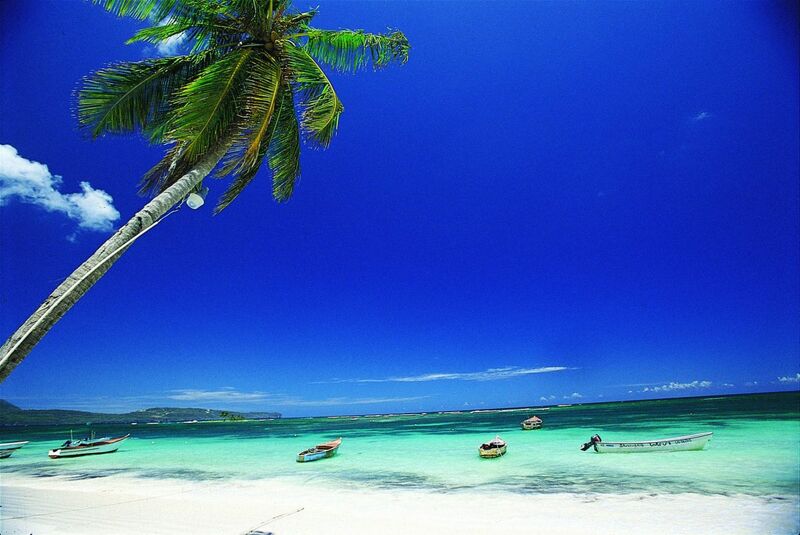 The beaches of the Dominican Republic are stunning, even picture perfect. They vary from miles-long, white, sparkling sands, to secluded boutique beaches nestled between rocky promontories, to bays and lagoons with sand ranging in color from sugar-white to golden-tan. They are next to forests and cities, below soaring cliffs and surround small islands. They are ideal for various reasons, so our assortment of the top 10 range from the practical and ideal for families, to romantic and secluded. All of them are beautiful. After all, they are palm-fringed and tropical. We would go to any one of them at any time. #1 . . . Our top 10 countdown starts with the beach at Bahia de las Aquilas in Juragua Park in southwest Dominican Republic. You get there from the entrance of the park by boat or a bumpy ride in a jeep down a dirt road. Either way, a Robinson Caruso-style destination is on your agenda for the day—a secluded beach that will probably not have another person on it. From the entrance of the park to the beach is two and a half miles. The boat trip passes high, limestone cliffs dotted with cactus. Your reward is a long stretch of sugar-white sand and clear water. With a 20 foot visibility, the SCUBA diving is spectacular and can be accessed from the beach—heaven on earth. 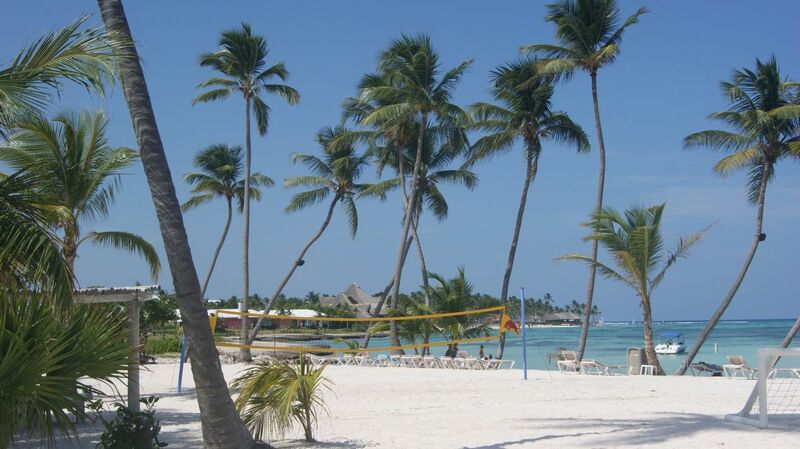 #2 . . . is Punta Cana, the most popular beach in the Dominican Republic, mostly because it is used by the guests of the plethora of all-inclusive resorts along its 67 mile length that borders waters that are, for the most part, calm, shallow and clear. Despite the many resorts, there are long stretches of beach where there is nary a soul. 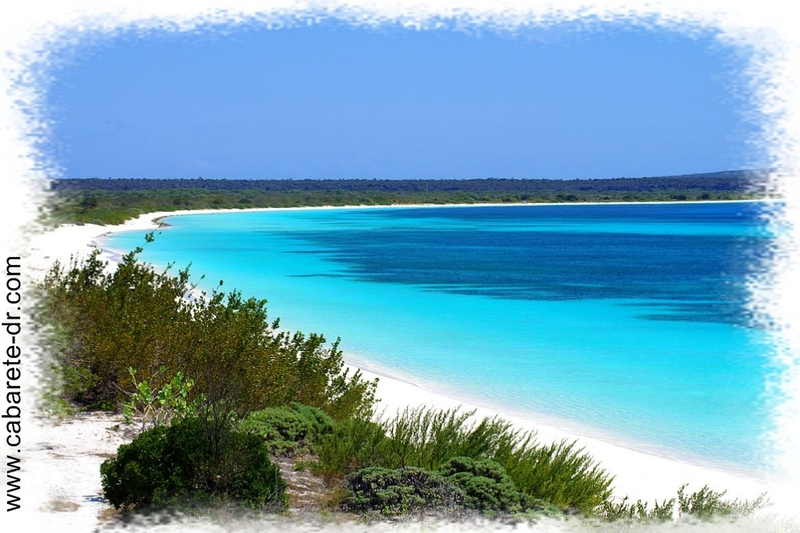 #3 . . . is Cayo Arena (Sand Key), located way offshore in the northwest near Monte Cristi. However, it is known mostly by its poplar name of Paradise Island, and for good reason. This itty-bitty, remote coral island of a few hundred square yards is topped with sugar-white sand and is surrounded by same in shallow water, which is then encircled by coral heads. How can you go wrong? No, it is not deserted. Other people come, but not many. Because it is way off shore, and is only accessible by boat, distance keeps a lot of people at bay. Vendors in bamboo huts with palm-thatched roofs sell welcomed rum and fruit drinks. If you were to put in an order for the ideal, tropical, all-day get-away in the ocean, as a couple, with family, or with friends, this would be it. It is ideal for snorkeling, becoming mentally numb and going goo-goo, gaa-gaa as you admire your good fortune for finding Paradise Island. Not many do. #4 . . . is Playa Grande in Cabrera. When the surf is up, which is not always, it is great for body surfing. You can also have a guide take you in his boat to visit nearby caves. 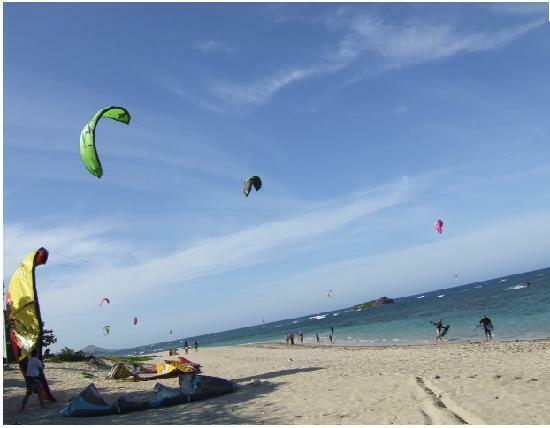 Popular with Dominicans, the beach can be busy on weekends, particularly during the summer. But not many people during weekdays the rest of the year. On the west end of the beach, below a cliff, are a few little, beach-side restaurants selling fish for lunch straight out of the sea in front of you. They cook what the fishermen bring in—a variety that includes red snapper, lobster and shrimp. Walk up the side of the cliff and at the top is Play Grande Golf course, the last one designed by Robert Trent Jones, Sr. He said it was his best. 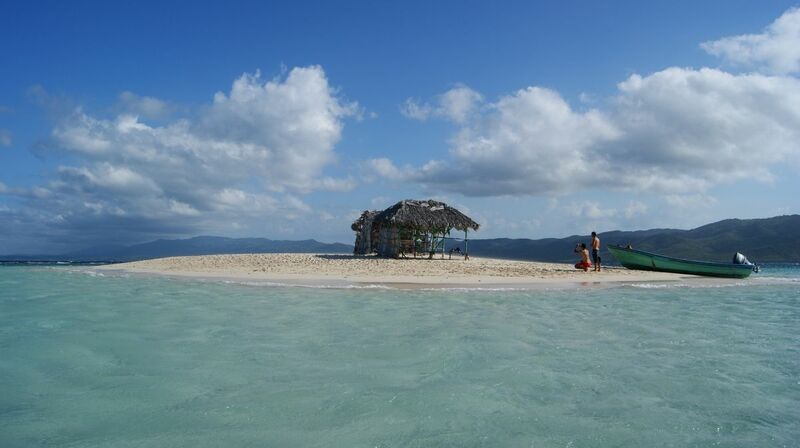 #5 . . . is Isla Saona, a small island in La Altagracia Province in the southeast, on the Caribbean side of the Dominican Republic. Doesn’t this look too good to be true? Yes, it does. But all the same, it is true. Isla Saona has the unique quality of being both popular and pristine. 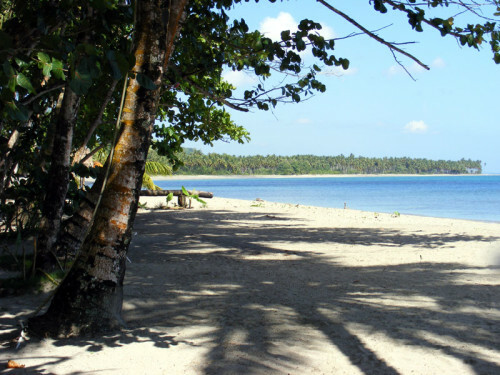 Though it is the most visited island in the Dominican Republic, by private craft and organized tours, its wooded area and beaches remain free of any commercial build up because it is part of the government-protected nature reserve, Parque del Este. It is one of those places you visit and wonder why you have not done this before. 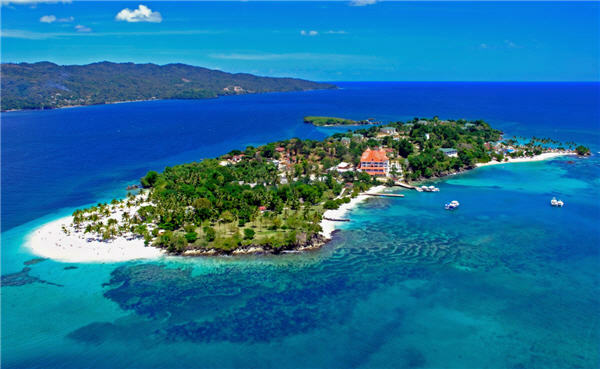 #6 . . . is Cayo Levantado in the Bay of Samana; the remote, bucolic and almost unspoiled region of the Dominican Republic. Several trails wander through its jungle-like vegetation. It is great for kids to wander through, for a tropical “Pirates of the Caribbean” adventure, without getting lost. There is a plus factor here. From mid-January through mid-March, you can watch humpback whales from the shore in one of the most important birthing places for them in the world, Samana Bay. # 7 . . . is Playa Diamante in a lagoon on the north shore in Cabrera. Two versions tell how it gets its name. One is that the sand is a clear as diamonds, and the other is that the water is as clear as diamonds. Either works well. It is a good beach for pre-teen children because it is one of those odd spots where the water is very shallow, about two and half feet, for about 200 feet out. Even when the water gets chilled by northern winds, like down to 74 degrees Fahrenheit, a hot water spring warms the sand beneath. Cool experience. 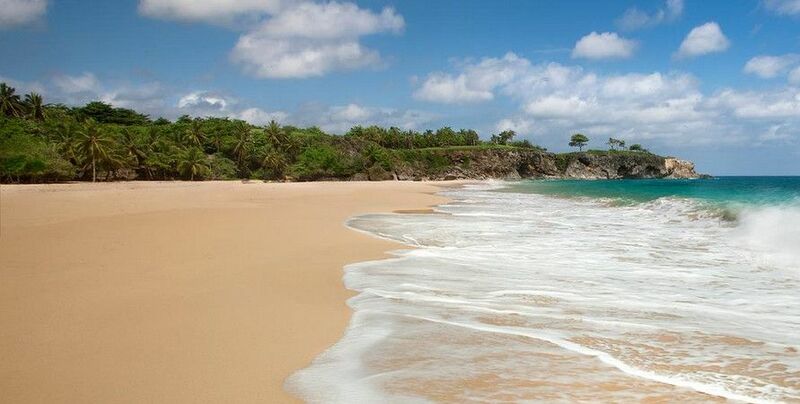 #8 . . . is Playa Magante beach on the north shore in Cabrera, perfect for relaxing, romantic getaways. 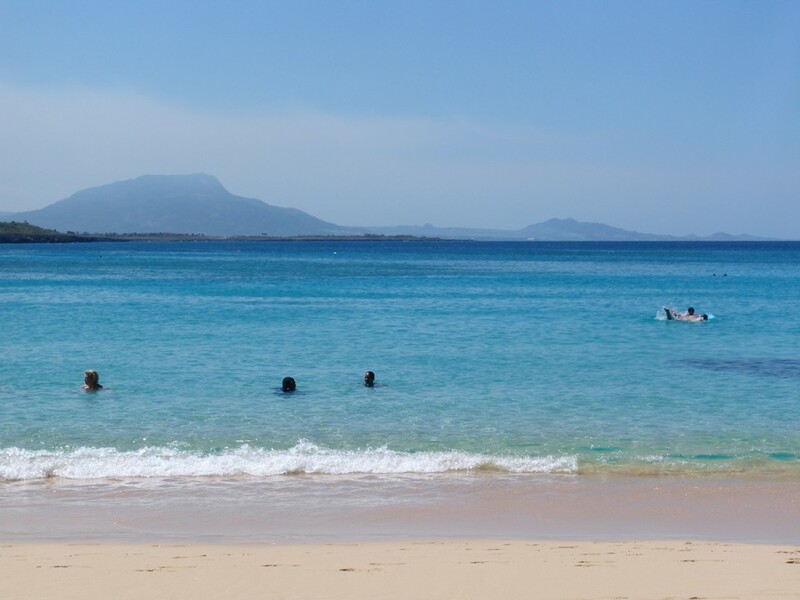 The beach is on a very wide lagoon that is protected by a rare coral, double-reef that breaks large waves into almost nothing, so the water is mostly pond-calm and clear all year. The vegetation that lines it has a wild, almost unruly, appearance. Dine on a shrimp and lobster platter and spend a night or two in one of three thatched-roofed bungalows at Los Gringos at the east end of the beach. For dessert you will want to eat the pineapple crepe. So good you will wonder why you ate the rest of the meal. #9 . . . The beach at Sosua Bay is on a wind-protected bay where the surf is rarely high and the water is almost always crystal clear. The bay is part of Dominican Republic’s Coral Garden Project, is full of colorful corals and friendly fish, and is absolutely first class for snorkeling, which you can easily do from shore. Its mile-long, crescent, tree-fringed beach is lined with shops (under and behind those trees), restaurants and bars. You can lie on a lounge and waiters will bring you lunch and piña coladas—this is your opportunity to drink rum and get numb in the sun. # 10 . . . is the beach along the Malecón in Puerto Plata on the Dominican Republic’s north coast. This three-mile stretch of oceanfront is one of the few beaches next to a malecon, which are long, sea-side walkways in major, Latin American cities. The breezes here are constant and cool coming off the North Atlantic and the beach is ideal for kite boarding, lounging or taking a long stroll and stopping at one of the many coffee shops and bars; and then roaming through this 511 year-old colonial city. Beach and history, together in one place—an unequalled combination. 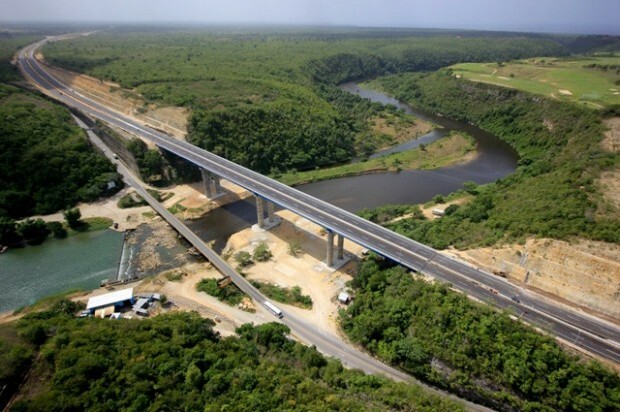 San Pedro de Macoris News – The Dominican Republic has formally opened the new San Pedro de Macoris La Romana highway. Dominican President Danilo Medina was on hand to inaugurate the new San Pedro de Macoris La Romana highway which is part of the government’s Eastern Tourist Corridor project. The 22-kilometre road project has the capacity for more than 2,000 vehicles per day across four lanes. The highway joins La Romana with Santo Domingo in just 50 minutes and with Punta Cana with just a 40-minute drive. It’s the latest in a series of large-scale highway projects undertaken by the country’s government in recent years.